Volunteers are the core of Cycle Oregon’s success. About 150 amazing individuals give their blood, sweat, tears and time every year on our events. It’s a serious commitment, and we have high expectations. But it’s also incredibly rewarding and full of fun and surprises; you meet hundreds of riders and community members, bond with your team members, spend your days in the great outdoors and see the most beautiful parts of Oregon. Perhaps you’ve thought about volunteering, but have some questions. New Volunteer Open House // March 1, 2017 // 6:30 p.m.
Open House for 2017 Volunteers // April 18, 2017 // 6-8 p.m.
We ask that our volunteers commit to the position for the full duration of the ride. Additionally, most teams help out with rider check–in on the first day of the event. Joyride – June 10, 2017: We will have limited needs on this event, but that doesn’t mean we can’t use your help. Most volunteers will arrive early on the day of the event. We’d love to see some new recruits from the McMinnville/Newberg/Dayton area this year! WEEKENDER – July 7-9, 2017: Volunteers arrive Friday afternoon and work through Sunday evening. Site Team arrives Thursday morning to set up camp and A.M. Sign Team begins working Friday morning. The Classic – September 9-16, 2017: Volunteers arrive Friday afternoon and work through the following Saturday evening. Site Team members arrive Wednesday night and Thursday morning to set up camp. Volunteer training: Typically two weeks before the event. You’ll get to meet your team members and have dinner on us. We provide a volunteer notebook with all the details of the event, talk through the challenges, and answer your questions. 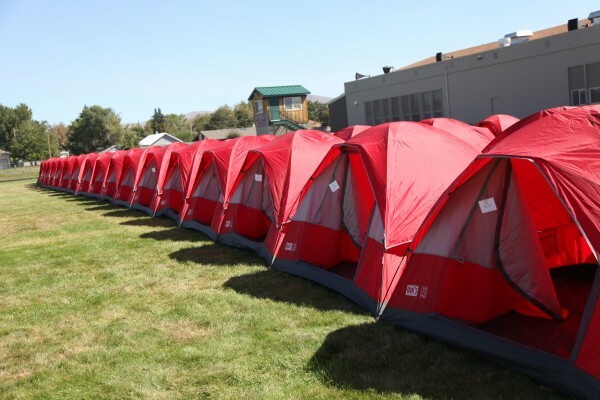 On The Classic, most volunteers sleep in the volunteer camp. We provide and set up a tent with your name on it at each site (chairs are included too). We try to locate the volunteer camp in a spot slightly away from all the commotion so you can get a good night’s rest. The WEEKENDER is based at a college campus and we provide volunteers with dorm rooms. The dorms generally have shared bathrooms and do not have air conditioning (bring a fan if it’s hot). You need to bring your own bedding and pillow, as well as toiletries and towel. Most Joyride volunteers arrive the morning of the event and are not lodged. While it is an early morning, the day wraps up around 4 pm. If your significant other is riding or volunteering, we will assign you to the same tent or dorm. If no one is accompanying you, we may assign you to a dorm with another volunteer, but we would never ask you to share a tent with another volunteer. Meals are provided for volunteers by Cycle Oregon on events. For The Classic and WEEKENDER, breakfast and dinner are served in camp and volunteers eat along with the riders. Sack lunches are provided for all volunteers and can be picked up as early as the prior evening. Meals are served in the campus dining hall on the weekend event and in the outdoor dining tent during our week long ride. If you have dietary concerns, speak to the volunteer coordinator about arranging supplemental meals and snacks. How do I get from site to site on The Classic? Different teams get to sites in different ways, but all volunteers are responsible for transporting their own baggage. Teams that are assigned vehicles drive them to the overnight locations and can often accommodate other passengers and their gear. We ask some team members to take their own vehicles (and reimburse them for fuel); other volunteers choose to drive of their own accord (and are not reimbursed). 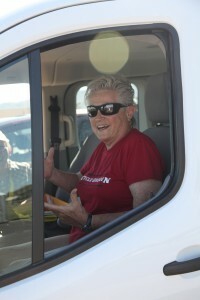 Usually volunteers in personal vehicles are more than willing to take on a passenger. As space is limited, we encourage carpooling as much as possible. If you need a ride to and from the event, we can arrange one for you. Every volunteer will receive a name badge, hat, and event t-shirt. Additionally we’ll provide you with a comprehensive volunteer notebook, meals, lodging and all the equipment needed for the job. For weeklong volunteers, you’re invited to a wrap up party that includes dinner, drinks and lodging. All volunteers are invited to our Volunteer Appreciation Dinner in February. Plus, you’ll get a million thanks from a thousand riders! Bring my dog – Sorry, but we can’t accommodate pets on our events. Invite a friend – Sure, we will try to find positions for both of you! Ride my bike – There are not many opportunities for volunteers to ride. Just work a couple of days – We know it’s a lot to ask, but we need a full commitment. Talk to someone about this – Of course! Give us a call or send an email. We’ve tried to answer some of the most basic, and most important, questions that new volunteers ask. If you have more questions, feel free to post them in the comments section below, email us, or give us a call. We typically put out the call for new volunteers in late February, so sign up for our newsletter and check our Facebook page for more information as it becomes available. Are the new volunteer open house and 2017 Volunteer open houses for selected volunteers or interested volunteers? What is the application time frame for New volunteers, interested in the volunteering for the Classic? and if we are unable to do the shorter rides, can we still apply to volunteer for the classic? I am interested in volunteering however the volunteer link is not working. So glad you’re interested! We’ll be opening applications for our 2018 events on February 6th, please check back then. I rode last year in the Joyride and would like to volunteer this year. How do I sign up? You can follow the link to our volunteer application on our volunteer page here! Is it still possible to apply for a volunteer position on the Classic? Yes! You can apply to volunteer here! There is a parent group at our school that was told this may be an opportunity for a fundraiser if we volunteer at this event. Can you give me more information on this possibility?